Discussion in 'Eastern Europe' started by PzJgr, Jun 27, 2018. Never heard of this one but viewing the pass in Google map I can see how it was a tough one. The way the memorial is laid out gives you a sense of how it was with tanks position throughout the valley. 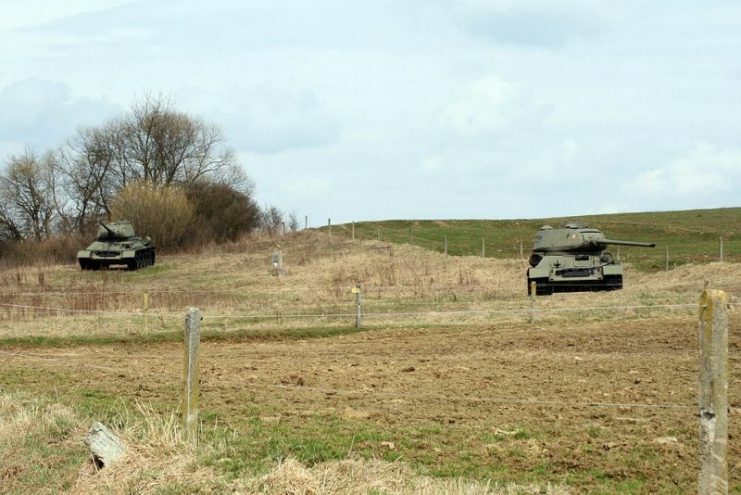 Military history aficionados had a reason to rejoice in May, as the Military Historical Museum’s department in Svidnik (Prešov Region) kicked off its high season by opening up some its various attractions in the field. The museum’s mission is the research and documentation of the history of warfare in Eastern Slovakia. Close to the Polish border crossing at Vyšný Komárnik, the Monument of the Czechoslovak Army at Dukla is one of the country’s most popularly visited sites. The death toll at this site included more than 60,000 Soviet and Czechoslovak soldiers. 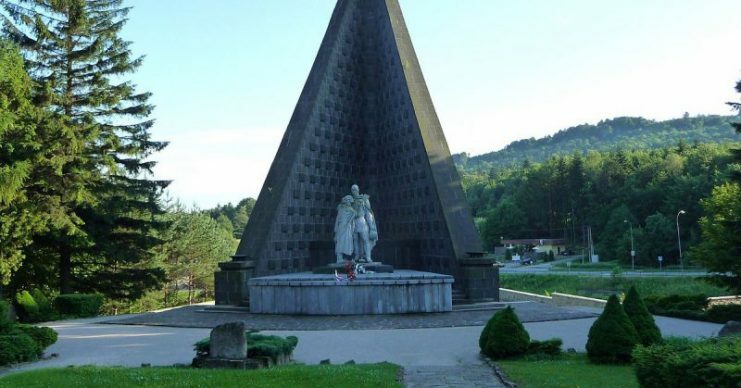 The 28-meter tall monument was built in 1949, and the military cemetery itself is intersected by a colonnade with bronze plaques commemorating the names and lives of the 1,265 members of the 1st Czechoslovak Army Corps who died there. The story of the 1st Czechoslovak Army Corps is a story of a great heroic struggle. They weren’t willing to simply wait for the Soviets to free them from the east but instead established the 1st as an exile army. It was established in the town of Buzuluk in the Ural Mountains of the Soviet Union under the inspired leadership of General Ludvik Svoboda. 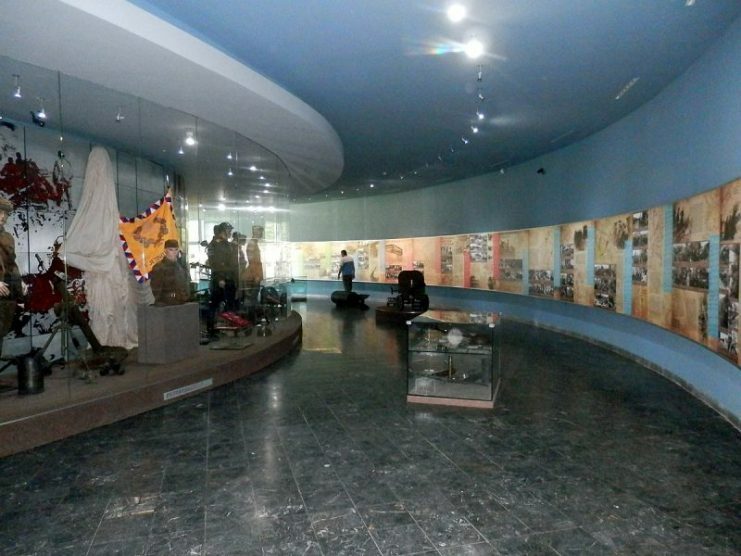 Another section of the exposition is given over to exhibits and archive materials from the military history of Eastern Slovakia during the peaceful inter-war period between 1918 and 1939. Battle of the Dukla Pass. According to Radomír Jančošek, the head of the Regional Tourism Organization (OOCR), climbing tanks and taking photos are popular not just with children and youths, but with everyone. 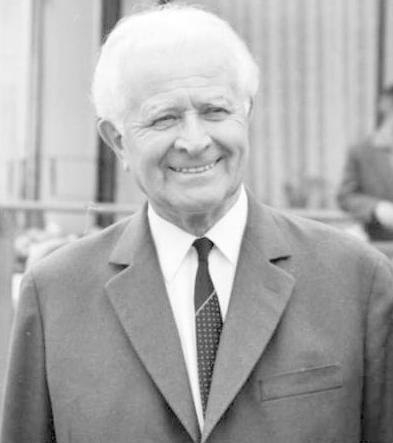 Founded in June 2nd, 1965, the museum’s present exhibition was installed in 1996. The exhibition displays the battles of the strategic crossing of the Carpathians during the Second World War. There are fifty-five pieces of heavy combat material leftover from the war, both in the museum and around the road to Svidnik. There are even functional bunkers in the nearby forests. 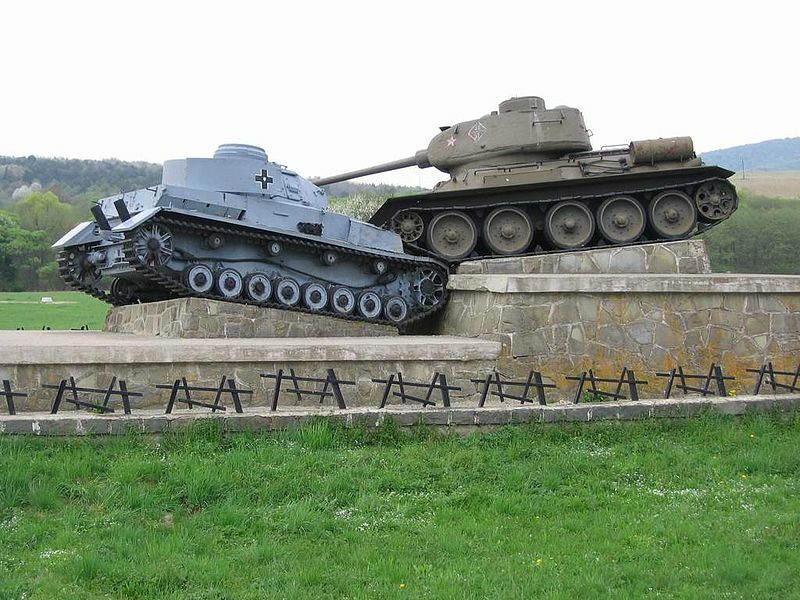 A german Pz-IV J (right) together with a Soviet T-34-85 – memorial of the Battle of the Dukla Pass of 1944, near Ladomirová and Svidník, on the Slovak side of the Dukla Pass. 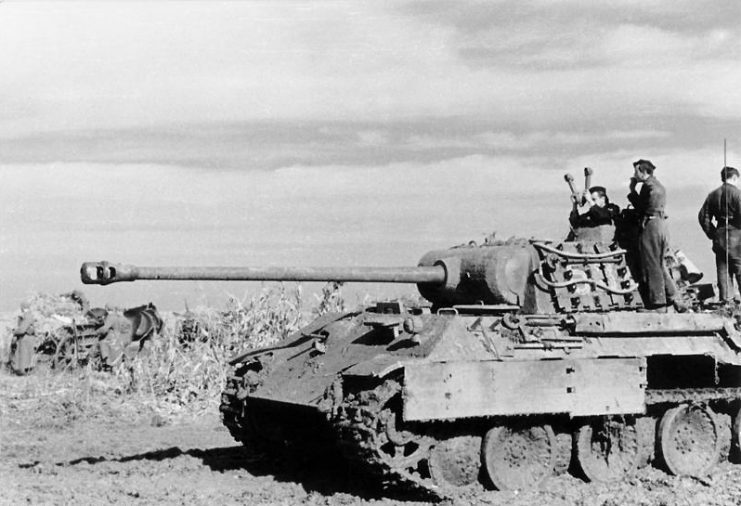 The Death Valley includes the villages of Vysna, Nizna Pisana, Dobroslava, and Kapisovka, and was the area where the hardest and heaviest tank battles took place, and it is also part of the exhibition. From on top of the 160 ft tall observation tower, visitors can see the entire battlefield, which was re-opened to the public in May 2011. The tower includes three exhibitions and sculptures, and is open Tuesday through Sundays, between 9:00 and 17:00. 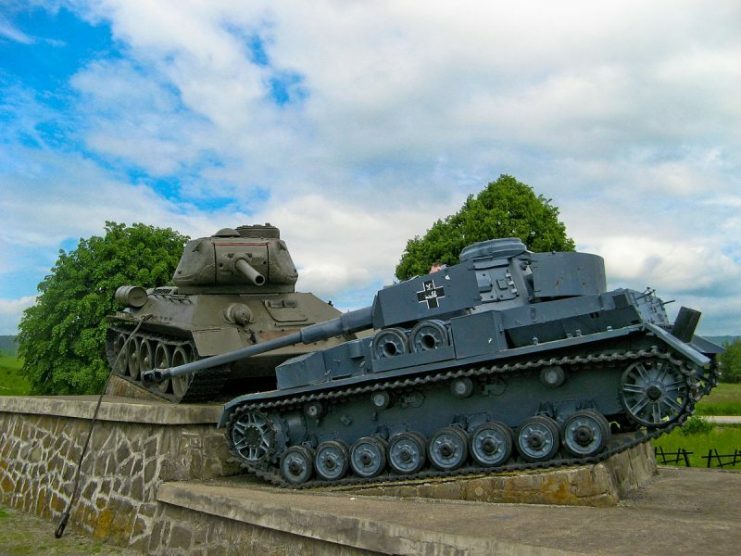 The Museum in Svidnik documents the battles waged during both World Wars in the northeast of Slovakia. The exhibition includes photos, personal items, various guns and battlefield findings from around Dukla Pass, each of which, in their own way, demonstrates the Carpathian-Dukla operation of 1944. There is also a nearby open-air park, only 12.5 miles away, that includes an exhibition of personal relics, authentic pictures of the battles, pieces of heavy military equipment, including various types of weapons, and a monument to the Soviet Army, dating from 1954, displaying the names of more than 9,000 Soviet soldiers killed in the autumn of 1944. A 13 ft tall brass statue of a Soviet sergeant stands guard in front of the memorial. The open-air museum also displays reconstructed firing positions of artillery, troops, and bunkers. The cemetery for the German war dead is at Hunkovce, where more than 3,000 young German soldiers met their end between 1944 and 1945. Kai-Petri, TD-Tommy776, ColHessler and 3 others like this.